The Mad Hatter has kidnapped Bruce Wayne, threatening to kill him if Batman doesn’t publicly reveal his identity on television. If you have any reason to be reading this you know why that’s going to be a problem. Luckily Superman overhears the broadcast and zooms in to help, teaming with Batgirl (with Robin missing and Nightwing too far away) to find Bruce and the Hatter before midnight. While Superman and Batgirl have different methods of getting information, they do eventually figure out where the Mad Hatter is broadcasting from. While Superman deals with a mind-controlled Robin Batgirl rescues Bruce and the GCPD. Then Superman uses a spare Bat-cowl to lure out the Hatter with his own hat obsession. The day is saved and the sun makes a rare appearance in Gotham City. 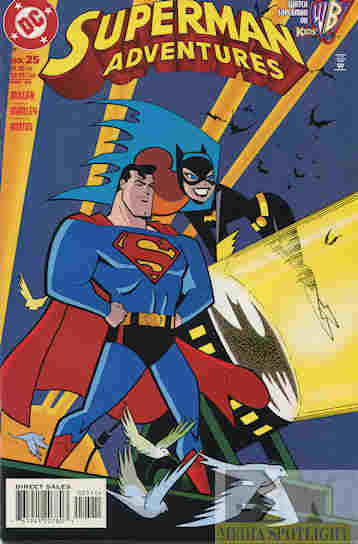 What they got right: Superman showed in Batman’s first DCAU #25, so the Bat-Clan returns the favor here. It is interesting and occasionally humorous to see how Superman’s methods don’t always work in Gotham or his unique way of using the Bat-method. (Like buying the crook he shook down a cup of coffee.) It just works without putting down how the Bat Family need to operate in Gotham. What they got wrong: Of course the aforementioned The Batman Adventures #25 was extra-sized with pin-ups and stuff while this is just another issue. And I wonder how many Bat-fans who hate Superman would not be happy with this tale even though it’s Batgirl that save Batman? Part of me wishes this had been in Metropolis to further return the favor of TBA 25 but it’s not a deal breaker for me. Recommendation: I happen to like both heroes (even if Superman is my favorite) and I thoroughly enjoyed this story. When it comes to comparing Superman and Batman’s (or Batgirl’s) methods this story is sadly left out and should be checked out. Posted by ShadowWing Tronix on January 20, 2018 in Animation Spotlight, DC Spotlight, Television Spotlight, Yesterday's Comics and tagged Batgirl, Batman, DC animated universe, DC Comics, DCAU, Robin, Superman, The Mad Hatter, Tim Drake.